The Appalachian Trail is often called the “green tunnel,” an acknowledgement of the dense forest canopy that surrounds the footpath. Couple that with uneven terrain that demands downcast eyes and you have an experience that by and large is devoid of the spectatorial beauty used to advertise and celebrate the trail. Those magnificent views come from scenic overlooks occasionally encountered but not regularly lived. 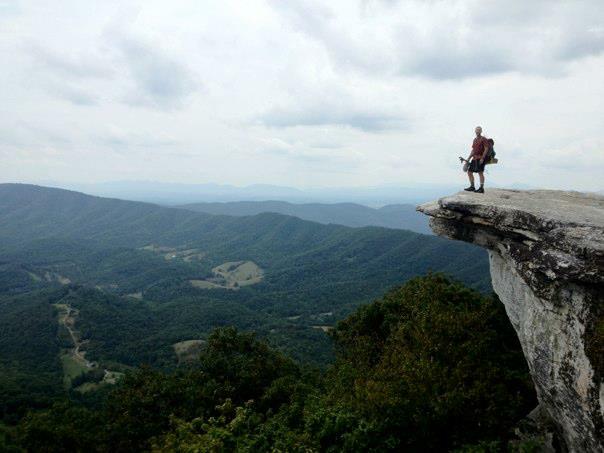 Still, most long-distance hikers seek that momentary spectacle, looking for the hiker’s sublime. They seem to understand pleasure, definitely know pain, and without doubt experience more than their share of natural beauty. I cannot even begin to explain what motivates long-distance hikers. Many want to test their resolve in the face of deprivation over long stretches of space and time, others simply enjoy the simplicity the hiker’s life brings, but all, on some level, acknowledge the desire to experience isolated mountaintops, silent forests, cascading waters. Although over time its fortunes have risen and fallen in aesthetic theory, the concept of the sublime maintains a special place for walkers–the experience of awe that is awful, a beauty that overwhelms, something that arrests as well as upends. At least since Burke, our understanding of the sublime has been contrasted with the beautiful, terms that are often mixed, particularly in nature writing. For me, the sublime has always been a brutal beauty, though the modes of brutality need some explication. As an aesthetic category, the sublime can be encountered in language (Longinus), nature (Kant), or the visual arts (Lyotard), but it always remains within a discourse of power, specifically of being overpowered. However in most accounts, it–similar to beauty–is either spectatorial or is passively experienced through speech or reading. It is a moment of arrest–a hiatus–producing awe, terror, and a pleasure somehow derived from pain; it belittles and makes anxious. We are puny in the face of its “irresistible force” (Longinus). Not far from the Appalachian Trail is Virginia’s “Natural Bridge,” a limestone formation once owned and surveyed by Thomas Jefferson who, in Notes on Virginia calls it “the most sublime of Nature’s works.” When regarded from below, it is quite a sight, but, as Jefferson further notes, visitors who venture to the top fear creeping to its edge: “Looking down from this height about a minute, gave me a violent head ache.” He acknowledges the sublimity of the view below, but “the view from the top [is] painful and intolerable.” Jefferson hung in Monticello a painting of Natural Bridge by William Roberts, a work that participates in the spectatorial sublime, as does viewing the bridge from the stream bed. However Jefferson’s embodied experience on the precipice is different, resembling trekking in the big outside with its uncertainty, anxiety, pain, and sometimes fear. For Burke, terror is the sublime’s “ruling principle.” It is lived in an instant though it is the product of a slowly building situation. Terror in the sense of breathless fear is not a common experience of the hiker, but a low-grade anxiety about health, safety and loss, an anxiety not regularly experienced by people in familiar surroundings, is part of what could be called the ambulatory sublime. Beautiful scenes–the ubiquitous “scenic overlooks”– are staged by an enframing that brings them into foveal vision, into a comfortable spectacle. Evolution linked adrenaline and the flight response to peripheral vision, the fear that is invoked by movement on the edges of perception. Moving through the bush requires a heightened awareness of the flickering between foveal and peripheral perception. There the micro-sublime is lived at the edges of perception, where uncertainty and danger lurk. On the Te Araroa, hikers often have to follow poles topped by orange cylinders marking the pathless trail. Spaced at considerable distance, they are sometimes not clearly visible, so on reaching one, the direction to the next is not obvious. The orange chosen for marking stands out from the rest of the landscape, but it is most easily distinguished by peripheral vision, that part of sight best equipped to notice the anomalous in the field. Hikers searching for the next marker saccade across the scene, using low-level anxiety to find their way across what feels a vast and inhuman landscape. Such moments are obviously not the sublime in any traditional sense, but they structure a hiker’s form of attention. Like vision flickering from foveal to peripheral, walking is both spectatorial and immersive, a double move described by the inveterate walkers Wordsworth and Thoreau. Hikers stop for the spectacular, are arrested by those moments, but then continue on, feeling both the loss of the scene and the possibility of an even better one at the next turn. They are moving bodies immersed in a moving nature. Hall of Fame hiker William Wordsworth is reputed to have walked 180,000 miles in his lifetime. Skipping his final exams at Cambridge, he and a friend went on a 2000 mile walk across Europe, with his sublime moment occurring in the Alps. Definitions of the sublime usually focus on a moment, that awful singularity, but such moments pass and walkers continue their journey. For them, the sublime opens out over time and is experienced as anticipation, arrest, loss, and continuation. Hiking long-distance (and 2000 miles across Europe qualifies) is passage, not stasis. Hikers may creep out onto the edge of the precipice, but they also will spend most of the day trudging step by step in less heart-pounding circumstances. Ended in this–that we had crossed the Alps. Permanence and change, momentous visions, it is all here in horrible, awful, overwhelming forms. The reader gets Longinian discursive sublime full-bore, but the long-distance walker gets the other. Theirs is a stationary blast passed by. The pain is not nausea or terror, but footsore pain/pleasure at seeing that which is nominally and normally unavailable to all but the most intrepid. The beauty is brutal, and the experience is brutalizing. Wordsworth missed marking his crossing of the divide, but as he well knows, walking is always about loss. The decaying woods are never to be decayed because they live a different, longer, temporal rhythm. At the same time, walkers are acutely aware of their temporal rhythms, the need to mark out the day’s trek, to not get lost, and to live the way intensely. Long before hordes of Appalachian Trail hikers began to arrive at Baxter State Park to climb Mount Katadhin marking the end of their 2000 mile journey, Thoreau attempted an ascent which he documented in The Maine Woods. Although a part of the massif now bears his name, Thoreau’s climb was unsuccessful (if you define success as attaining the summit). He set out from his group’s encampment just below tree line early one morning filled with hope only to be stymied by the notoriously difficult weather near the peak. 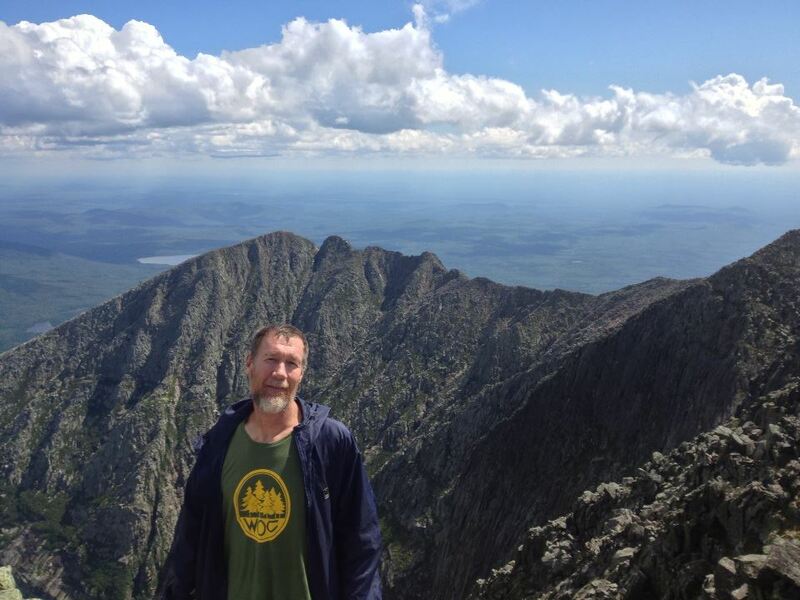 He attained the top of one of Katahdin’s shoulders but in the mist could not make out the actual peak. Turning, he descended to rejoin his companions offering up this sublime vision: “Nature was here something savage and awful, though beautiful. I looked with awe at the ground I trod on, to see what the Powers had made there, the form and fashion and material of their work.” Then, “Here was no man’s garden, but the unhandselled globe. It was not lawn, nor pasture, nor mead, nor woodland, nor lea, nor arable, nor waste‐land. . . Man was not to be associated with it. It was Matter, vast, terrific, ‐‐ not his Mother Earth that we have heard of, not for him to tread on, or be buried in….” Thoreau is firmly in the rhetoric of the literary sublime, offering up a vision of the inhuman which permeates such scenes, but his experience of that climb is another sublimity. His passage, his inability to comprehend the misty, craggy, inscrutable world he was passing through, was filled with amazement and anxiety. Retracing his steps down a pathless scree in hopes of clearer weather or a sign that he was on the proper way, Thoreau as walker lives the ambulatory sublime and experiences its brutality. Back in November, I woke in Upper Travers Hut hearing Grant, an expedition leader, stoking the fire in the wood stove, and before too long his hiking crew started rustling about. I packed, made oatmeal and coffee, then had a second cup while talking with the crew when I really should have been hiking. 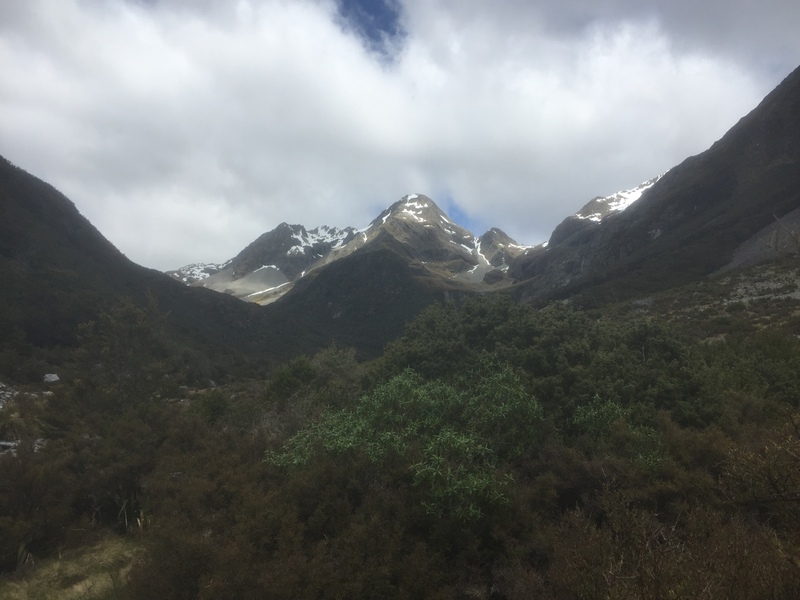 Ideally I wanted to get to Waiau Forks to camp that night, but that required an early morning climb over Travers saddle which is 1700 + meters and then, late in the day, Waiau Pass which, at 1800+ meters, is the highest point on the South island part of the Te Araroa and also the most dangerous. Regretfully I said my farewells and started out. It was a sunny clear day as I climbed up above the bush line. All around were snow-capped peaks, and I made it to the top within an hour, lingering for a moment before starting the long descent to the Sabine River Valley. The winter snows, avalanches, and rock slides had pretty well taken out all the poles marking the lower part of the decent, so I followed rock cairns helpfully but haphazardly piled to show the way. By late morning I found the trail through the woods where I crossed the river and made my way up toward Blue Lake. Like the Travers, the Sabine is clear and fast running. At its headwaters is Blue Lake, the place where the body of the first hiker to die on the Te Aroroa was found. I arrived by midday and decided there was enough daylight to make the trek over Waiau. The trail took me past Lake Constance which rivals Blue in color and beauty though getting around it required some hard climbing and narrow ledge hiking. The last bit was on a gravel beach at the water’s edge. The waters coming into it came across a wide flat plain that the trail followed. It gradually narrowed to a canyon surrounded by snow-capped mountains with nothing that looked like a pass in evidence. Then trail markers made a sharp turn and went straight up the side of one of the mountains which might have had a little bit of a dip in altitude compared to the others, but hardly deserves the name “pass.” The initial climb was on loose gravel, so each step slid back almost as much as it went forward. After an hour or so, I got the the first leveling off to rest. In mid-winter this is a high avalanche risk area, and I was uncertain what conditions reduce that risk in the spring. 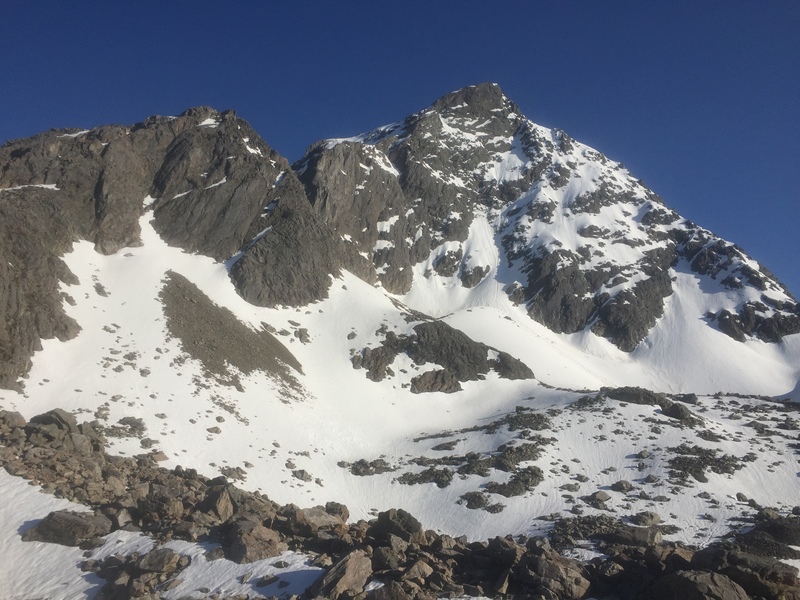 Soon I found myself crossing snowfields on the way up, and at the top I saw that the descent down the other side was deep snow for more than a third of the way to the valley floor. Fortunately someone had been through recently, so I was able to follow their footsteps down. I’m not sure how deep the snow was, but only the tops of the markers were visible and I would sink to about mid-calf with each step. 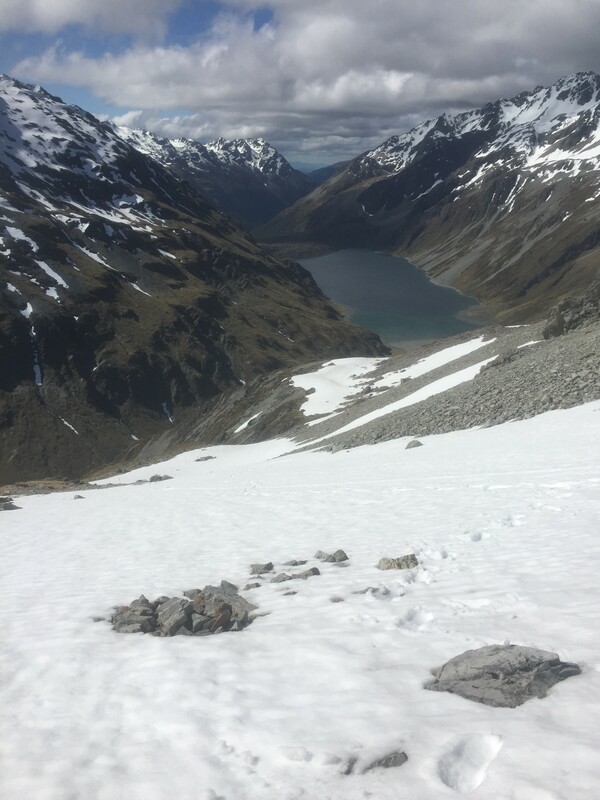 Sweating from exertion but with freezing feet, I finally got below snow line, followed the western branch of the Waiau River to where it met the eastern half. After eleven hours of hard hiking, I pitched my tent in a beech forest beside the river, built a small fire to dry out my shoes and warm my feet, then gratefully crawled into my tent ready for a hard night’s sleep. That day was not part of a discursive or artistic sublime. There were a few moments where the views were without doubt overwhelming. 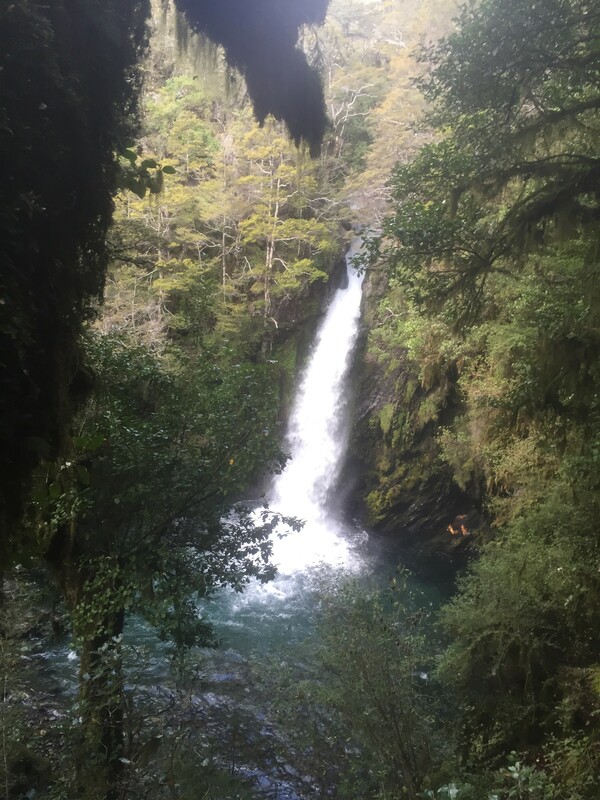 The Travers and Waiau Passes afforded scenes that surpass capture, and a Sabine tributary that runs through a deep roofless cave crossed by a narrow wooden bridge would surely have given Jefferson another head ache, but it was a day of the ambulatory sublime. A walk where pain was mixed with pleasure, confidence was shaken by uncertainty, and fear was promoted by both low-level anxiety and the real possibility of bodily harm–an intensity not captured by traditional aesthetic categories. It was temporal, embodied, and immersive, but above all, it was brutal.